A subcategory of speed reducers, worm gear speed reducers involve a major speed reducing configuration called right angle as well as being well known in the farming, automotive and manufacturing industries. The major parts of this gear box involve a helical gear, which has shallow teeth that are cut diagonally. Helical gears are known for their smooth and quiet operation, and when they are a part of the worm gear reducer they are the output gears, or the gears connected to the engine. A worm gear is another significant part in the worm gear reducer system, the input gear that is shaped like a screw with diagonal cuts like the helical gear, which is why they are often paired together. The two gears are able to convert a high speed and low torque input into the opposite; a high torque level with low speed. It is a small and sleek gear box, which means it is less expensive then other gear boxes and also has impressive shock absorption. Worm gear speed reducers are utilized by a wide variety of industries, such as the materials handling, automotive, aerospace, recreational, construction, food and beverage processing, oil and gas and textile industries. Worm gear speed reducers are used in many applications, including automation equipment, conveyors, compressors, printing presses, pumps, compressors, generators and robotics applications. They are also commonly used for packaging and special machinery. 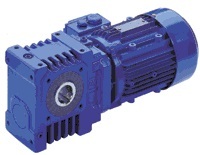 Re-manufactured worm gear reducers are commonly sold by manufacturers. While these often come at greatly reduced costs, they often lack a warranty. When selecting a worm gear reducer, consider the gear ratio, efficiency requirements, mechanical rating and thermal rating. One downside to using a work gear reducer is that it does not stay efficient as long as other gear boxes due to its size, although because it is a cheaper option, replacing it is not difficult. They also tend to lock-up when put into reverse, because of the shallow diagonal cut of the worm gear. It causes a friction that keeps the gears from moving. This is a characteristic desired by conveyor belt manufacturers. Worm Gear Reducers Worm gear reducers are right angle speed reducers used in applications involving low horsepower. Worm gear reducers maintain high gear ratios, high shock tolerance and compact design.